FREE TRACK SIDE PASS WHILE SUPPLIES LAST! Spend your Sunday at the Race! 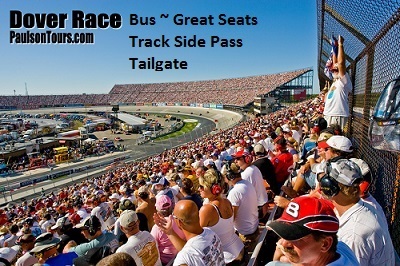 For PRICING & SEATING GO TO THE BOTTOM OF THE PAGE AND CLICK ON "COMPLETE BUS PACKAGES"
We have seating on the FRONT STRETCH, all turns, and tower seating! Group rates ~ Contact our group specialist Greg at (570) 706-TOUR! Check out the Dover Speedway for the DOVER 400 Race or if you driver wrecks you can tempt Lady Luck at the Dover Downs Casino! Race Tickets in the area of your choice! Pre Race Tailgate food with hot and cold food buffett. For Departure Times, please click on the red "ITINERARY" button to the right!